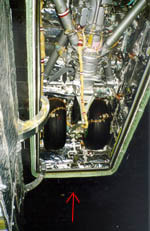 One can examine in more detail the landing gear of the analog-plane BTS-002: 2 sights of the train, on the left and of behind, the aspect of the space storage, and the trap door. 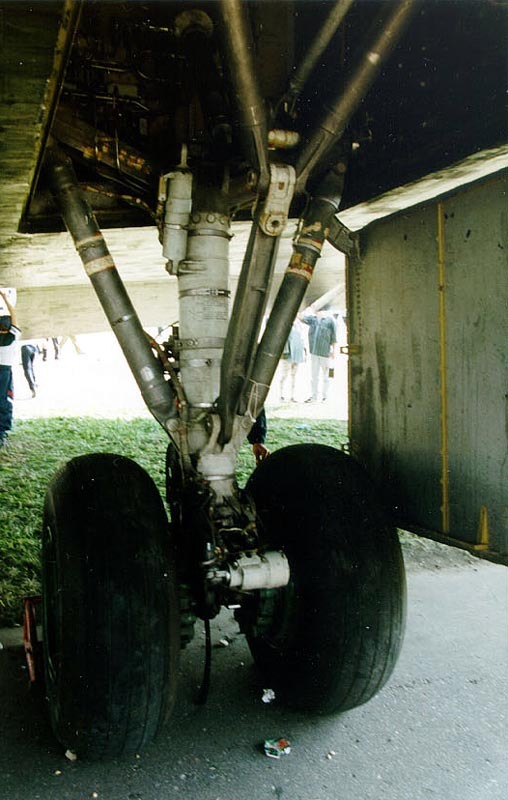 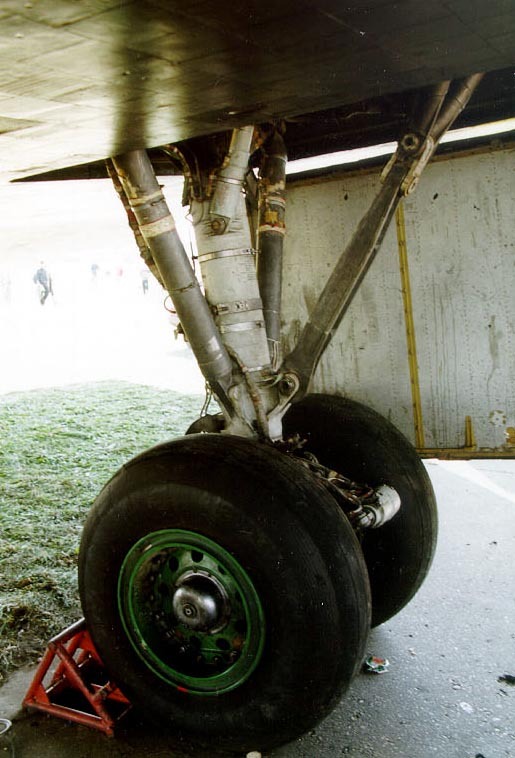 The structure of the landing gear of analog-plane BTS-002 is very close to that of Buran. Let us recall that the storage space of the landing gear is vacuum closed and is thermically isolated on Buran, moreover the trap door is covered by a layer of the heat shield. 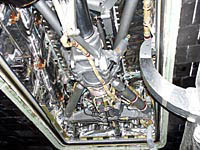 The closing system of the landing gear storage space and the trap door are quite visible on the photographs where the landing gear is out (photo in the workshop НИИХимМаш). 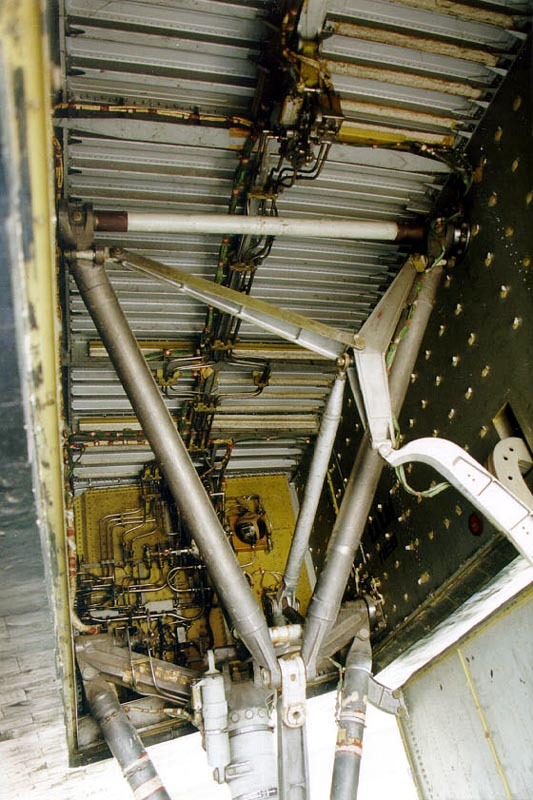 On the left photograph the red arrow shows the relative direction of the wind (we can see that the deployment of the landing gear is made against the wind); on the right photograph the machine system and the hermetical mechanism of the storage space is partly visible. 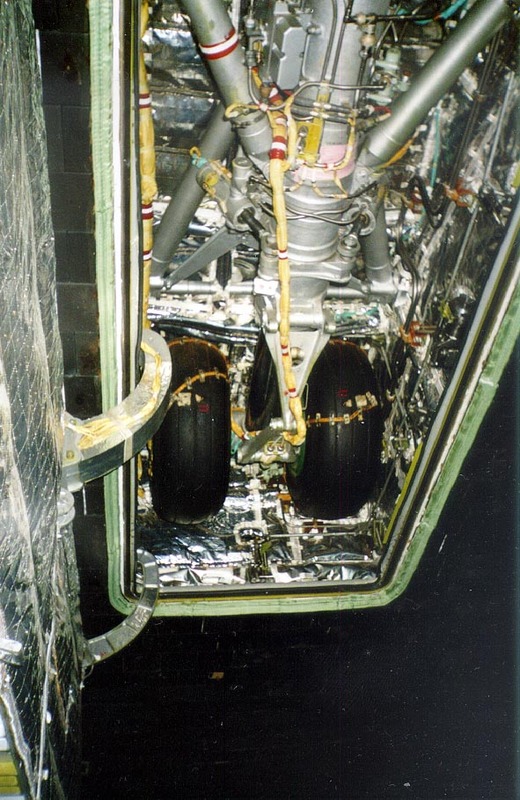 For the comprehension of the photographs it is necessary to know that this is photographs of the N006 model of the shuttle which was intended for the temperature tests, this is why the temperature sensors are present on all the elements of the storage space and the tires. After the temperature tests and the analysis of the results it was decided that for the operability of the landing gear it was necessary to heat the storage space during the flight. 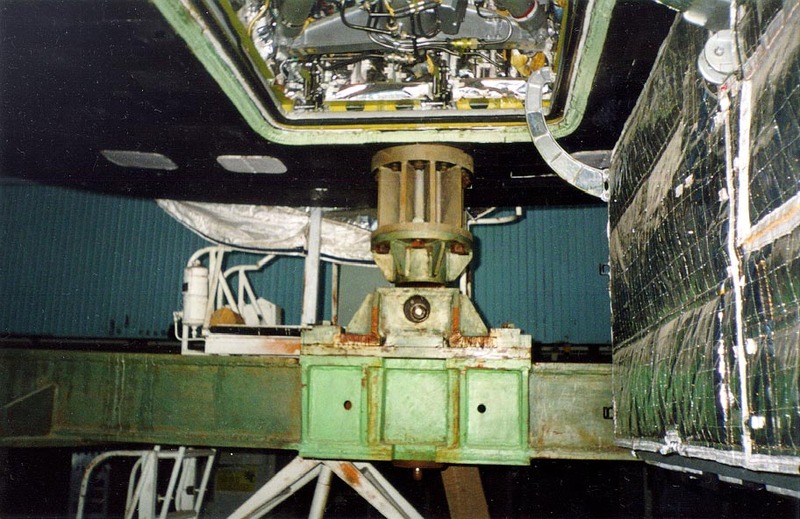 Additional photographs made in the museum of the space technique. 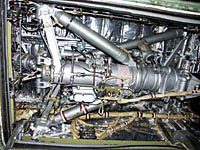 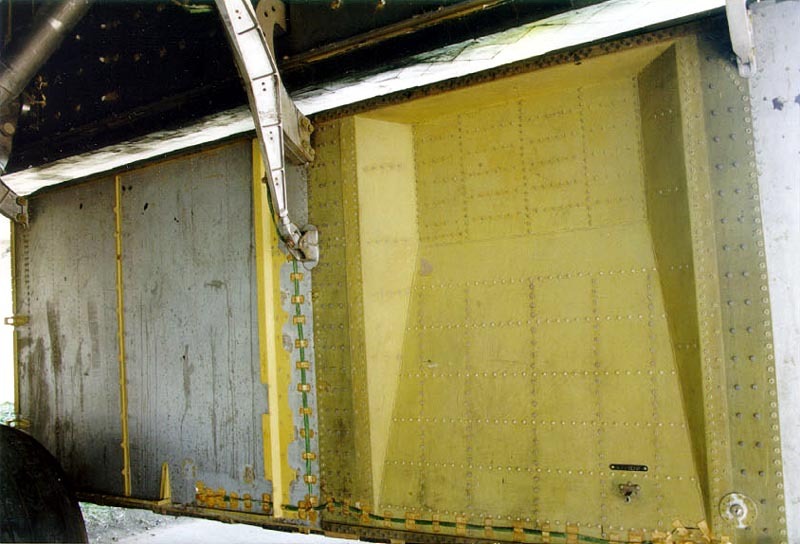 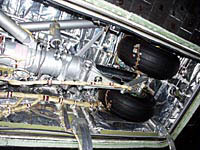 The installation of the chute-brake is useful for the deceleration of Buran on the landing strip, to relieve the wheel braking system up to 50 t and to decrease the braking distance by 500 m. The chute system includes, the pyrotechnical mechanism of the ejection of the lid, the fasteners of the chute, the system of reheating and the automatic block. 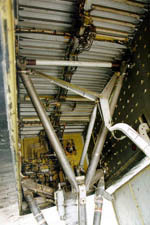 The ejection of the chute is done in an automatic way when the 3 landing gears touch the track. 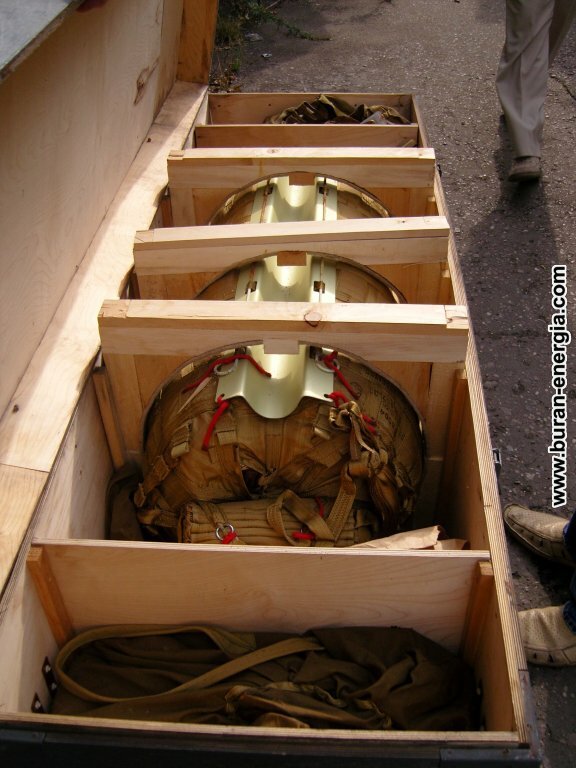 The lid is then ejected and the 3 chutes of cruciform form are spread. 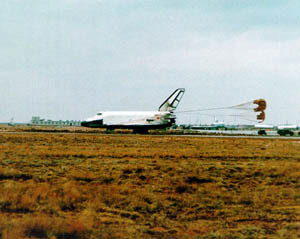 When the speed of the shuttle reaches 50 km/h the chutes are detached. 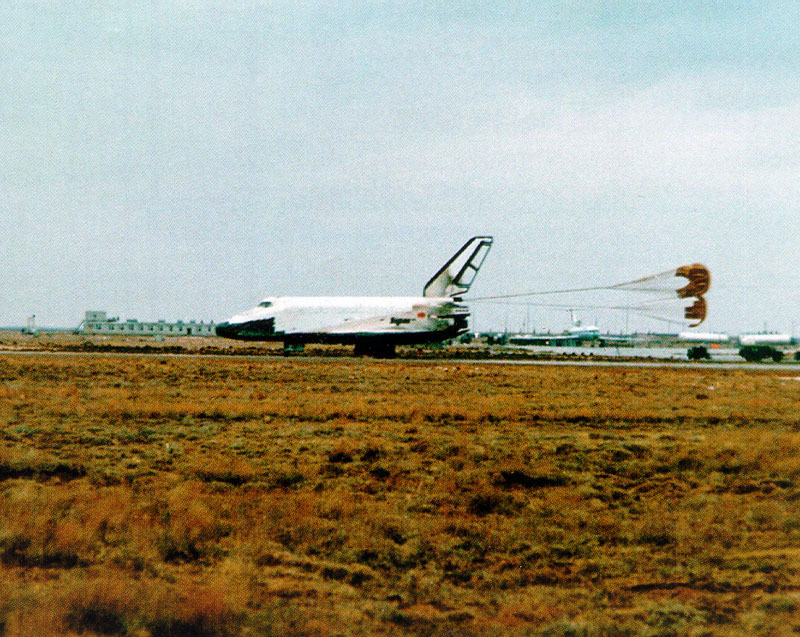 To guarantee the correct operation of the chute-brake system, heating resistances ensure a temperature of at least -50°C during the orbital flight, on the other hand during the descent the heat shield prevents the temperature from exceeding +100°C. 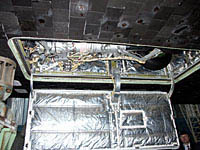 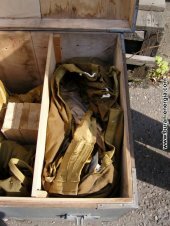 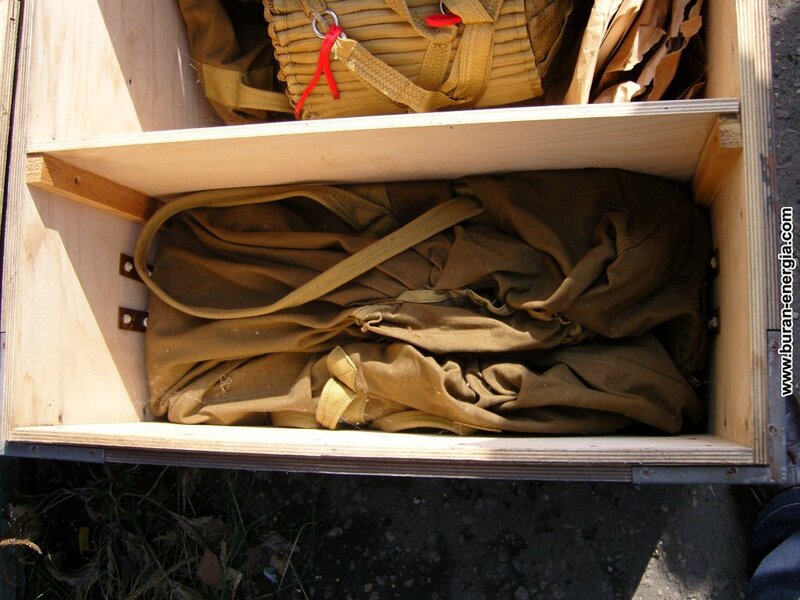 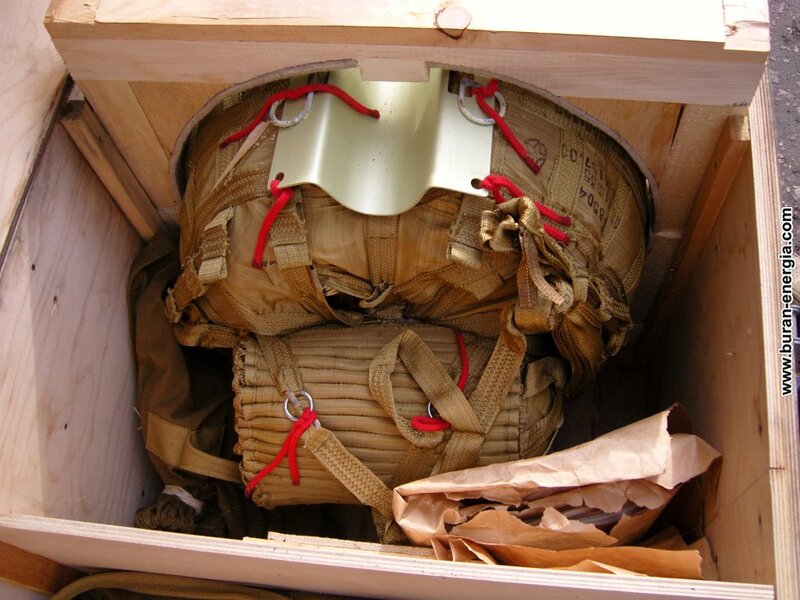 Pictures of the OK-2.01 shuttle chute in its carriage box (175kg).